AltaPointe has one mission…to plan and facilitate a comprehensive, behavioral healthcare system that promotes the wellness and recovery of people living with mental illness. We achieve this goal with employees who are courageous in the face of change as our organization grows to serve even more people with exceptional customer service. AltaPointe is proud to recognize these employees through its AltaPraise program. 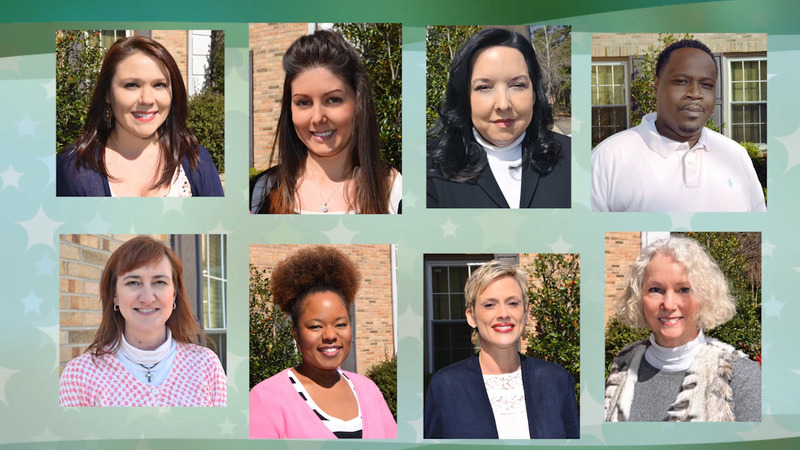 Patients, their families and coworkers submitted nearly 400 AltaPraise cards this past year and after a thorough selection process, 8 individuals were selected as our 2014 AltaPointe Stars of the Year. Listen as each one explains their role when it comes to changing lives. Our first star of the year is RITA METZ, CarePointe specialist. Rita’s sweet spirit and genuine concern for others comes across daily. She spends the majority of her time on the phone as the first line of help for people coping with mental illness. She demonstrates compassion and a willingness to help regardless of who is on the other side of the call. Rita’s co-workers praise her for her consistent customer care in an ever changing environment as well as her drive to seek out new responsibilities within CarePointe. Our next star of the year is JENNIFER HORNUNG, assistant nurse manager with adult residential services. Jennifer joined AltaPointe following the merger with Baldwin County Mental Health. Co-workers say she has stood out as a star from day one, always one step ahead of what need to be done while embracing change. Jennifer says her job has changed since the merger…before she did everything from cook lunch for residents to drive them to doctor appointments. Now she is able to perform the nursing duties she was trained for…all the while demonstrating five star customer service. Up next on this year’s star roster…KIM DYSON, BayView therapist. Kim is praised time and again by the people she cares for and co-workers alike. Patients describe their time with Kim as life changing. Co-workers say Kim displays exceptional customer service by working late hours to accommodate clients, offering support during crisis, and always puts the needs of others first. Our next star is a slam dunk when it comes to providing winning customer service. DANTE CRENSHAW, Transitions Team therapist. Dante works to help troubled teens and their families get back on track. His mantra – be the change you want to see in the world. Dante is praised for his dedication to the young people he serves. He’s known for organizing basketball tournaments and pick-up games to give kids something to do during non-school hours. This former cop’s commitment to five star customer service is unmatched. Next up in our star line up…SARAH CURRIE, juvenile court liaison. Sarah’s commitment to five star customer service helps teens struggling to find a positive path change their lives. She’s known for going the extra mile to help teens in need connect with AltaPointe’s continuum of care…often times working extra hours and taking on extra duties. Sarah is described by co-workers as efficient, enthusiastic and kind. Her steadfast approach to promote positive relationships and cooperation with all parties involved in the legal process is unsurpassed. Our next star is found walking the halls of BayPointe Hospital. JUANITA JOHNSON, therapist. Juanita is a praised by co-workers, outside vendors and patients for her warm and caring demeanor. Her positive personality puts patients and their families at ease and promotes change. Co-workers say she is a team leader with a contagious smile, and genuine ability to care for others who need it the most. Her job brings her into contact with people who are at their sickest…and she provides an avenue for them to recover. Next up in our star roll out is CHRISTE ELLIS, nurse manager adult outpatient services. Christe is praised by her co-workers for going above and beyond to help during a crisis. They say she does so with calmness and compassion all the while making sure patient needs are met. Christe’s commitment to five star customer service never wavered during the recent changes implemented due to the merger with Baldwin County. These days Christe is found on both side of the bay. Co-workers say her approach to care shows she understands each day is a chance to change someone’s life. Final star of the year is ANNE CHIPMAN, assistant director for child and adolescent outpatient services in Fairhope. New to AltaPointe, following the merger with Baldwin County Mental Health, Anne has been described as the shining star in the midst of massive changes. Anne works tirelessly to guarantee that her staff is ahead of all the change. Her optimistic approach and five star customer service skills ensure we will come through this historic era of behavioral healthcare changes in a positive way. AltaPointe is proud of its 2014 Stars of the Year. All of whom provide five star customer service fulfilling our mission while adapting to change.